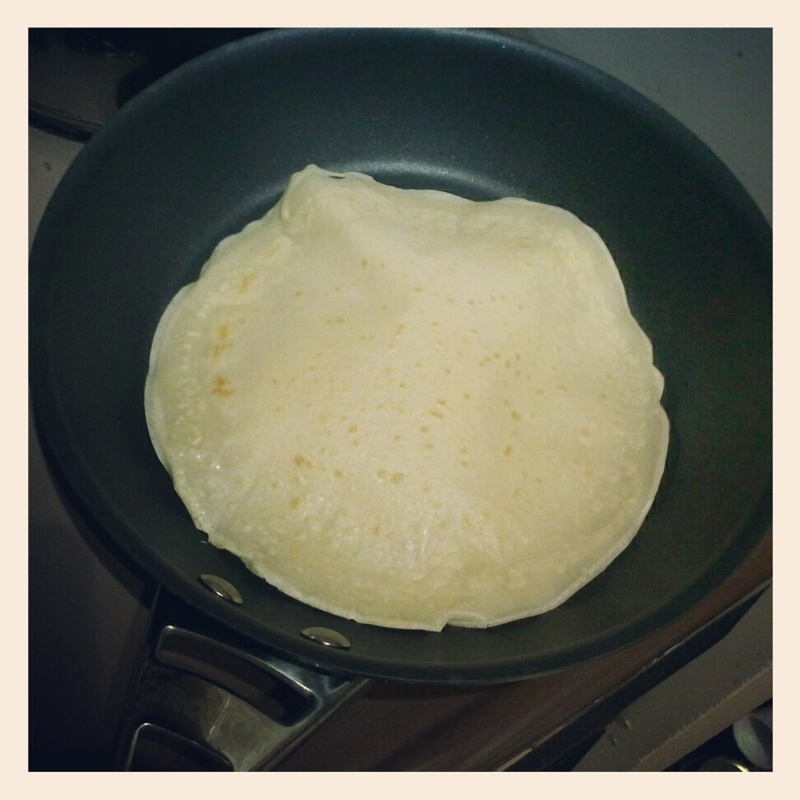 Yesterday was Pancake Day (or Shrove Tuesday) – definitely one of my favourite days of the year! I love pancakes. When I was little we’d have pancake races on the village green, followed by pancakes with lemon and sugar – but my favourite pancake topping has to be maple syrup. 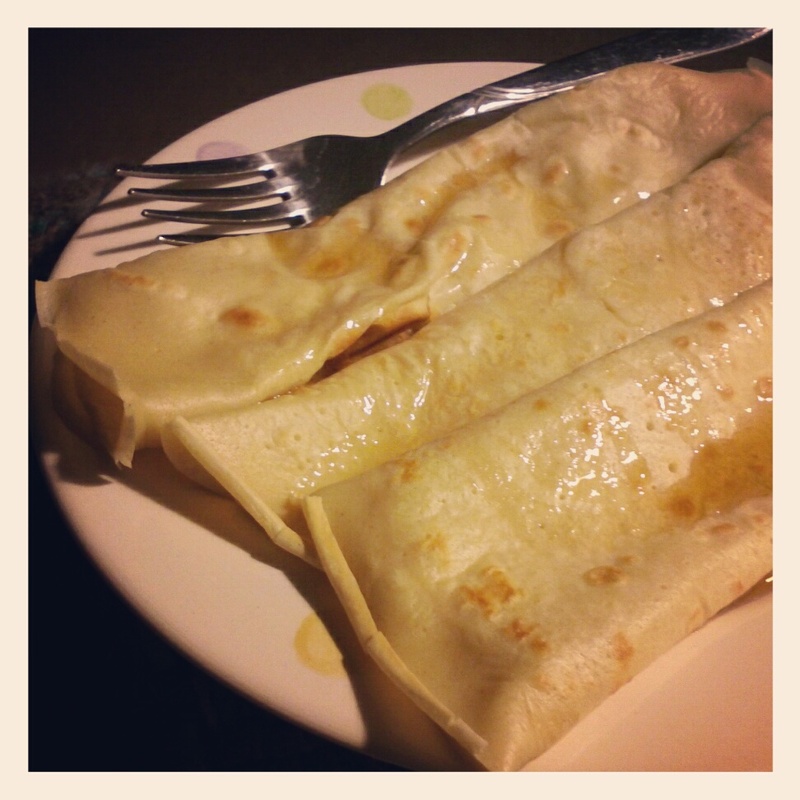 Because I’m extremely greedy, I like to make a full-on two-course pancake feast with savoury and sweet pancakes. Well, the alternative is to make a batch of pancake batter and just eat five or six of them with a ton of maple syrup, so making a ‘main course’ and a ‘pudding’ out of it actually makes me feel a tiny bit less greedy! 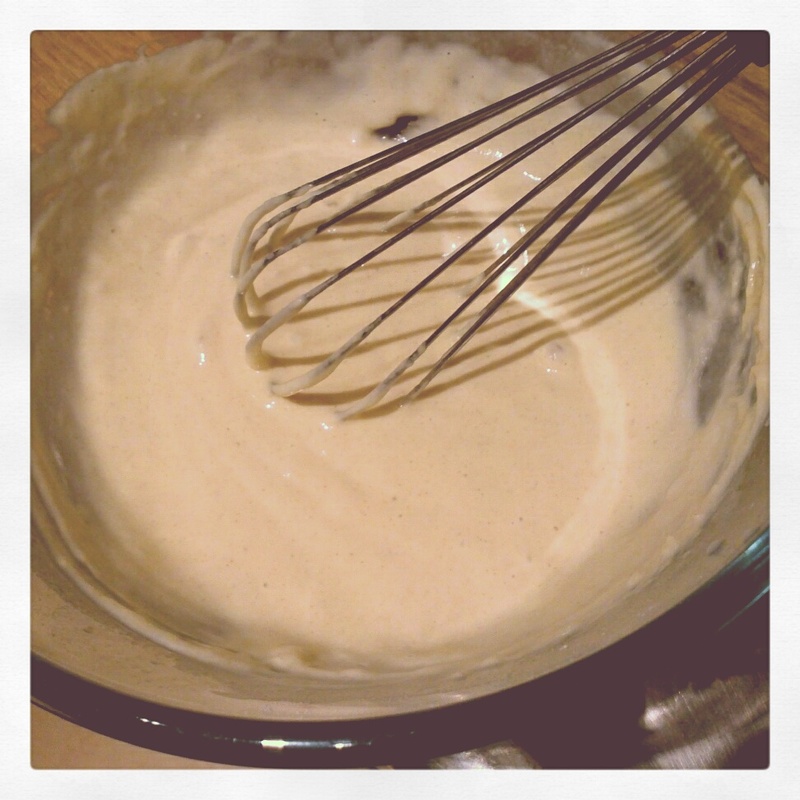 The shops are always full of packets and bottles of ready-made pancake mix, which I don’t understand because making pancakes couldn’t be easier – I use four heaped spoonfuls of plain flour, one egg and enough milk to make a batter with the consistency of double cream. I got a set of really lovely new pans for Christmas, so this was a real test for my new frying pan, but it was absolutely brilliant. I didn’t even need to use any oil, and even the first pancake came out perfectly! 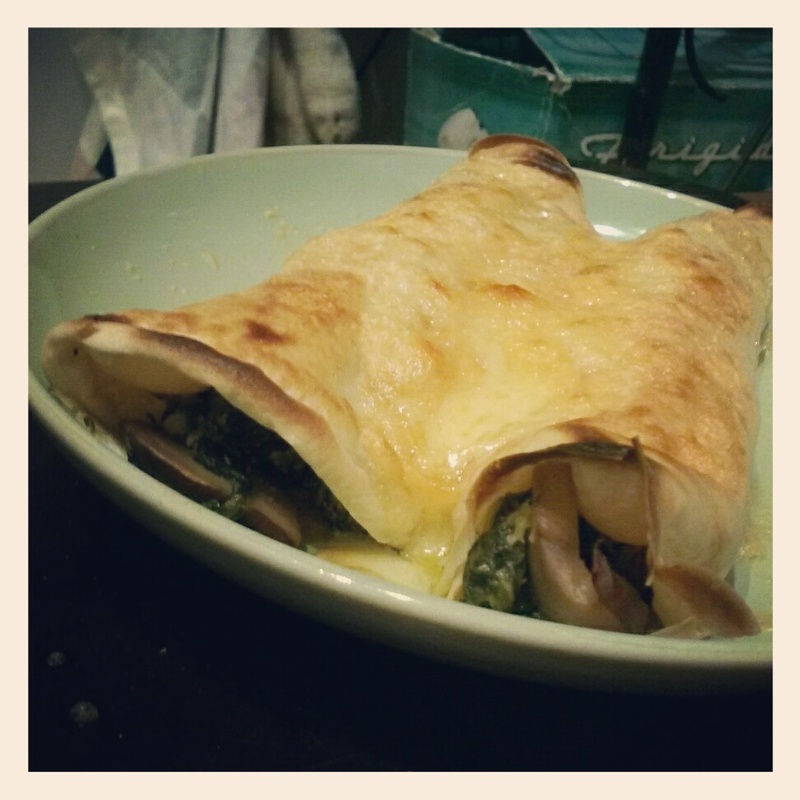 So I started off with my savoury ones, which had a filling of mushrooms, broccoli, spinach and a bit of crumbled Stilton. I’m a cheese fiend, so I grated a little bit of smoked Cheddar over the top and put it under the grill to go all bubbly and gorgeous. And then it was time for the main event – the maple syrup! Yes, I ate five pancakes all by myself. I’m not even sorry. 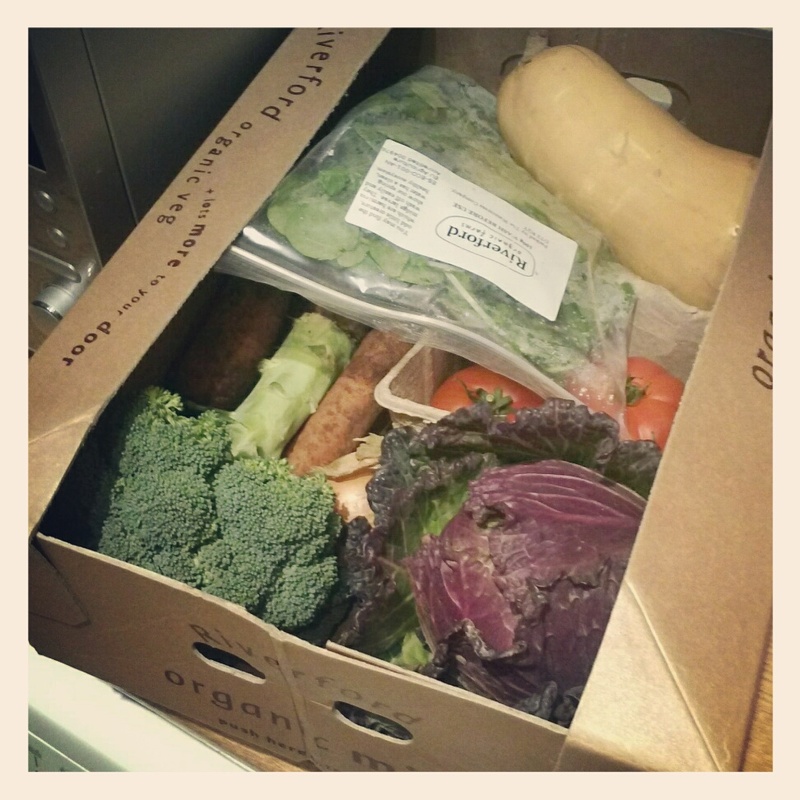 A little bit of a soggy veg box this time, thanks to the odd bits of sleety rainy rubbish that we keep having! Luckily it wasn’t out in the rain for too long, so everything survived – the potatoes are back, along with carrots, parsnips, onions, broccoli, two long red peppers and a big bag of curly kale. 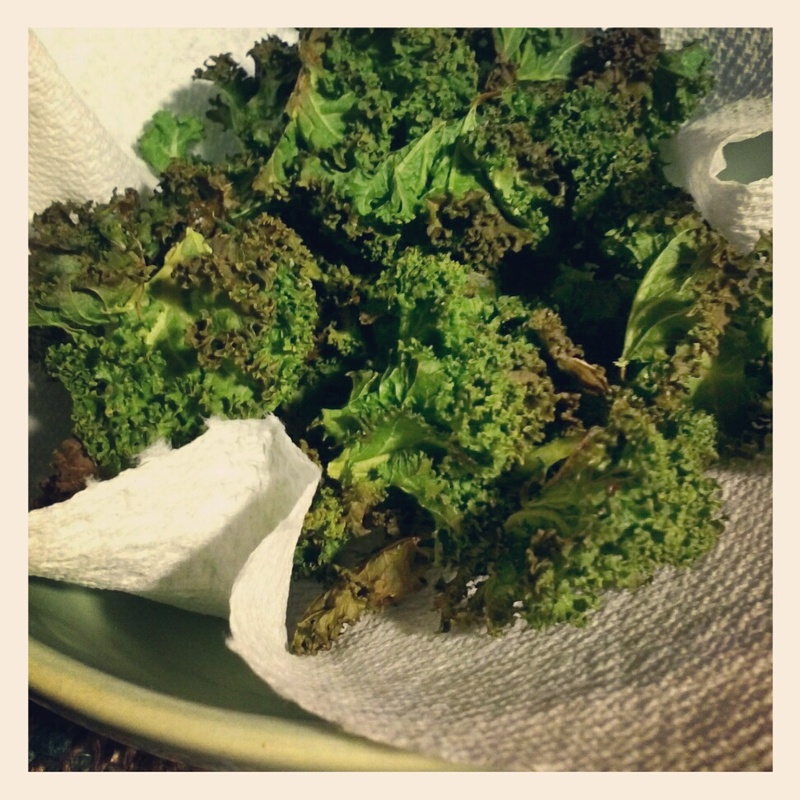 The kale gave me a chance to try something I’ve been meaning to try for ages – kale chips. They’re one of those trends that seemed to sweep the entire food blogging world a while back, and my last attempt was a bit of a disaster as I forgot they were in the oven and ended up with charred bits of cabbage. Not ideal. But this time I watched them like a hawk and it worked! All you do is wash and dry the kale, strip the curly bits from the tough stems, put them on a baking tray with some foil or non-stick paper, spray them with a bit of oil, and put them in the oven at about 200C until they go all crisp and slightly brown at the edges. The window between ‘crisp and slightly brown’ and ‘charred and bitter’ seems to be about 30 seconds, so watch them! I sprinkled mine with some salt and pepper, and they were delicious. They’re really tasty and despite having practically zero substance (and therefore practically zero calories) they really do satisfy that nibbly snacky feeling. If you like roasted broccoli, you should definitely give these a go. A friend of mine sprinkles hers with a tiny bit of sugar and apparently that gives them a takeaway crispy seaweed vibe! 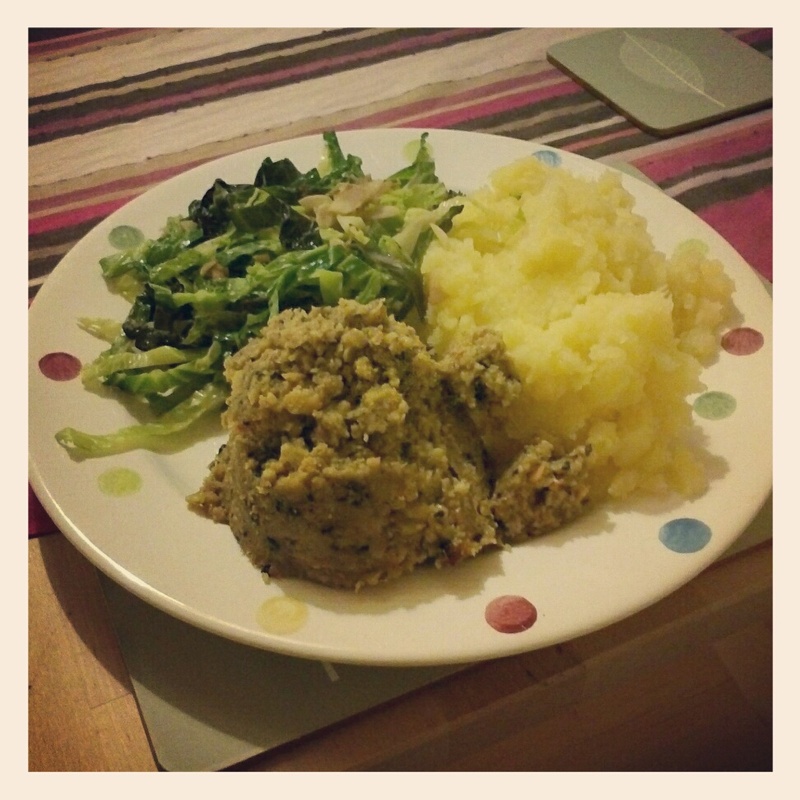 So I managed to find a vegetarian haggis in Waitrose, and last night I made myself a Burns Night supper! The haggis was really easy to cook – you just wrap it in foil and bake it in the oven – and I only had half of it last night (which was more than enough!) so today I fried a slice like a big piece of veggie sausage and had it as part of a post-run veggie fry-up, with an egg and some beans and grilled tomatoes. It was delicious and there’s still haggis left over! Unfortunately my Burns supper didn’t involve any whisky, firstly because I don’t like it and secondly because of this morning’s 12-mile run, but I did have haggis, neeps (that’s swede to us English people, which I cooked and mashed with a bit of butter and pepper) and some probably inauthentic but very nice cabbage. 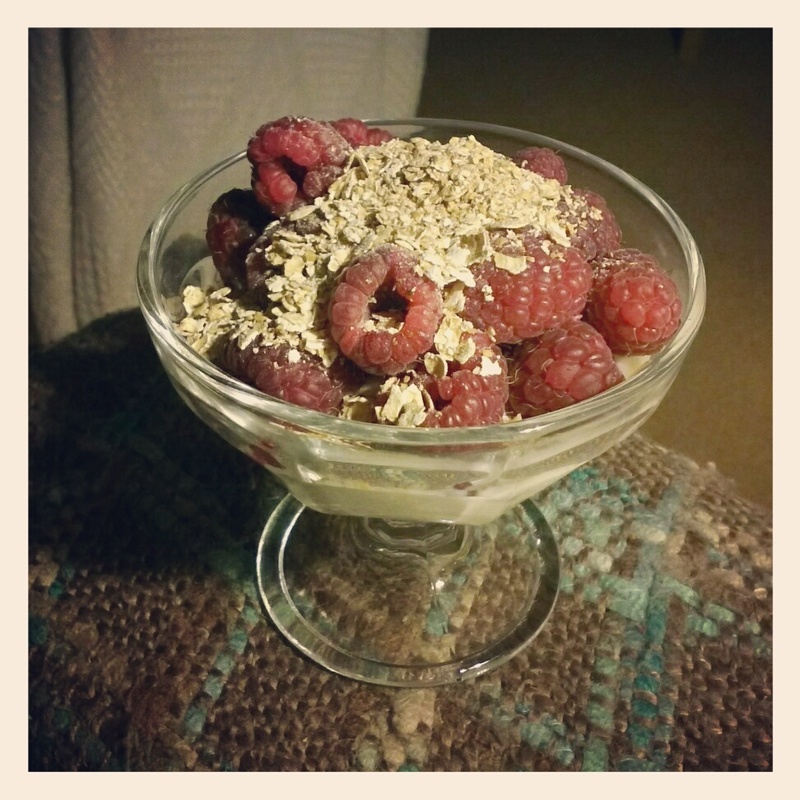 To finish off the Scottishness I even made a healthy version of cranachan – technically it should involve lashings of whipped cream, honey and whisky, but mine was fat-free Greek yogurt with raspberries and toasted oats. Not bad for a non-Scottish person! I was extremely excited not to receive any potatoes – I’d managed to do a good job of using up my previous bag, so we’re safe from the Great Potato Mountain for a while! Instead I got the usual carrots and onions, a butternut squash, broccoli, tomatoes, watercress (anyone have any idea what to do with watercress beyond turning it into a soup or using it as salad leaves?) and a very colourful January King cabbage. 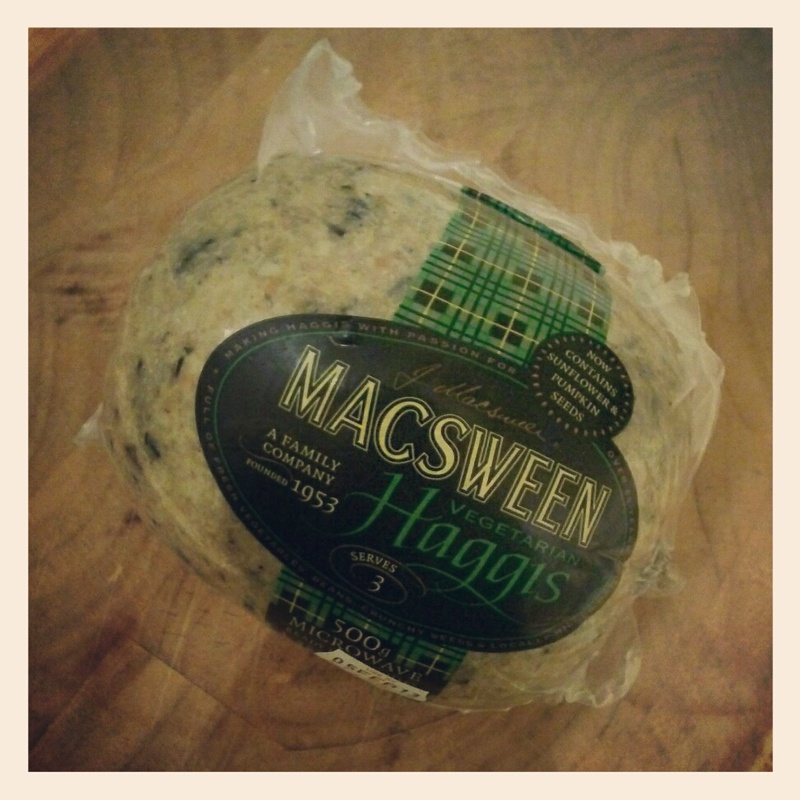 As I still have half of the Giant Swede in the fridge, I’m thinking of doing a Burns Night supper tonight – if I can locate vegetarian haggis in Waitrose – I’m not remotely Scottish but it seems like a fitting way to use the swede! Luckily around the time that I gave up eating meat altogether, we lived near a lovely restaurant with a brilliant chef who always came up with delicious veggie dishes. 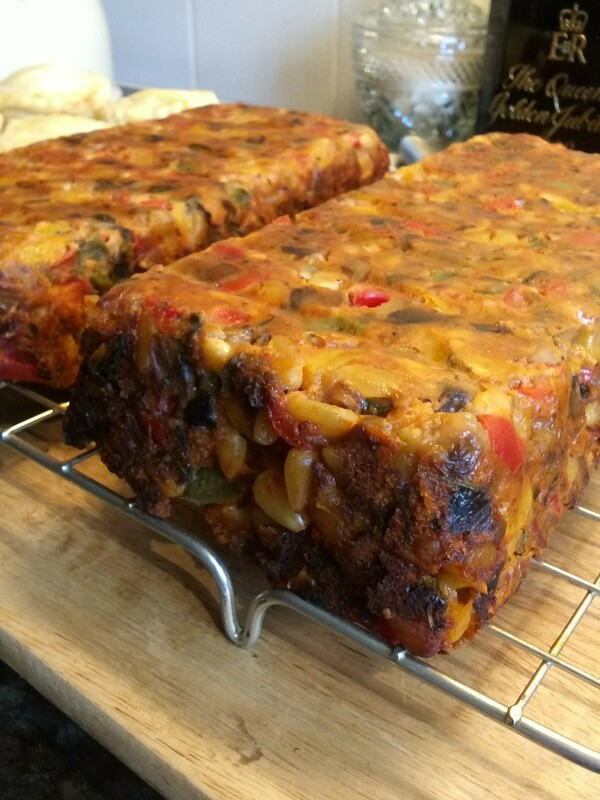 One year he put a pine nut and pepper terrine on the Christmas menu, and I loved it so much that my mum asked him for the recipe. And that’s what I’ve eaten on Christmas Day ever since. So it’s a bit late for me to post this, really, but you don’t have to follow my rules – to me, it’s as special and as festive as turkey or cranberry sauce or mince pies, because I only ever have it for Christmas lunch, but you could have it any time you liked! 1. Chop the peppers and mushrooms into small chunks. Fry in a little olive oil until everything just starts to go soft, then add the garlic and fry for another couple of minutes. 2. Add the pine nuts and breadcrumbs (the breadcrumbs should make up 50% of the total volume of the mixture). 3. Stir well and season with salt and a good amount of ground black pepper, then stir in the tomato purée and Parmesan. 4. Stir in the beaten egg and parsley (the mixture should be sticky and not dry). 5. Place in a greased and lined loaf tin, pressing down gently, and bake at 200C for 25-30 minutes, until the top is nicely browned. We have it hot, with redcurrant jelly melted with a bit of port, for Christmas lunch (the meat-eaters love it and have it as another accompaniment to their feast) and it’s also lovely cold. We call it ‘pine nut roast’ in my family, because ‘terrine’ doesn’t really describe it accurately I don’t think! As you can see, we always make two so there’s enough to go round on Christmas Day and for Boxing Day lunch and nibbly suppers during Christmas week! It also freezes really well once cooked. 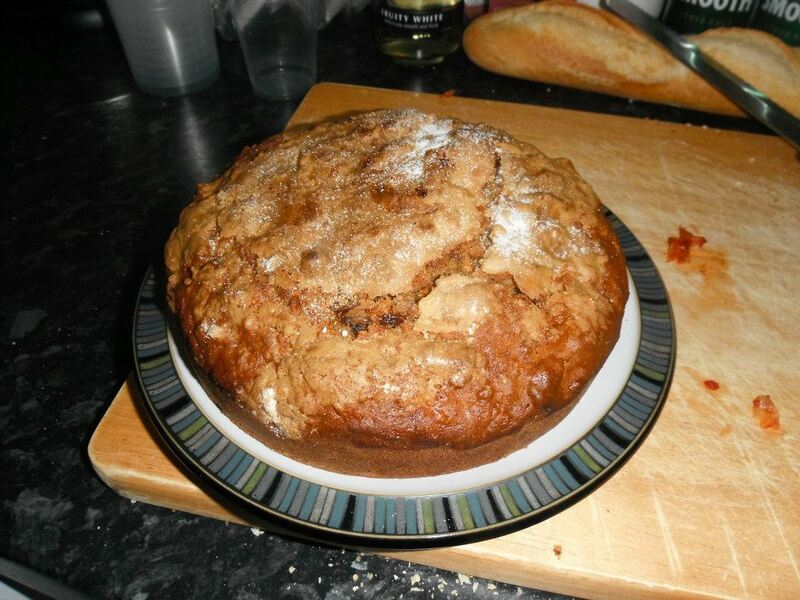 If you want the top to go brown, just whack it back in the oven for a few minutes once you’ve turned it out. It can be a bit crumbly when hot depending on the size of your egg and the amount of breadcrumbs and cheese you use, but it’s still delicious whether or not you manage to cut it into perfect slices! 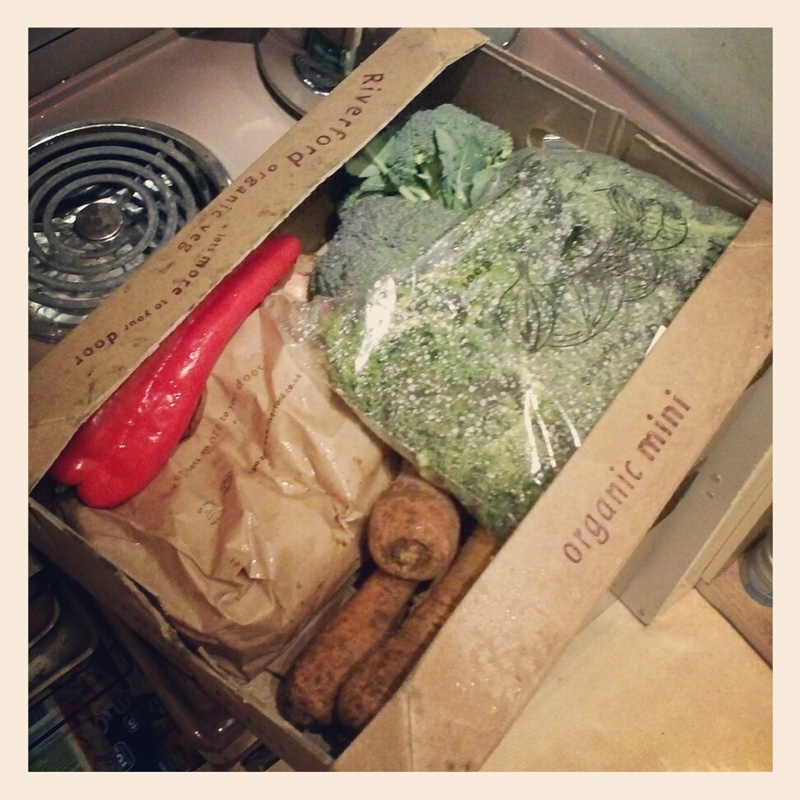 The first veg box of 2013! 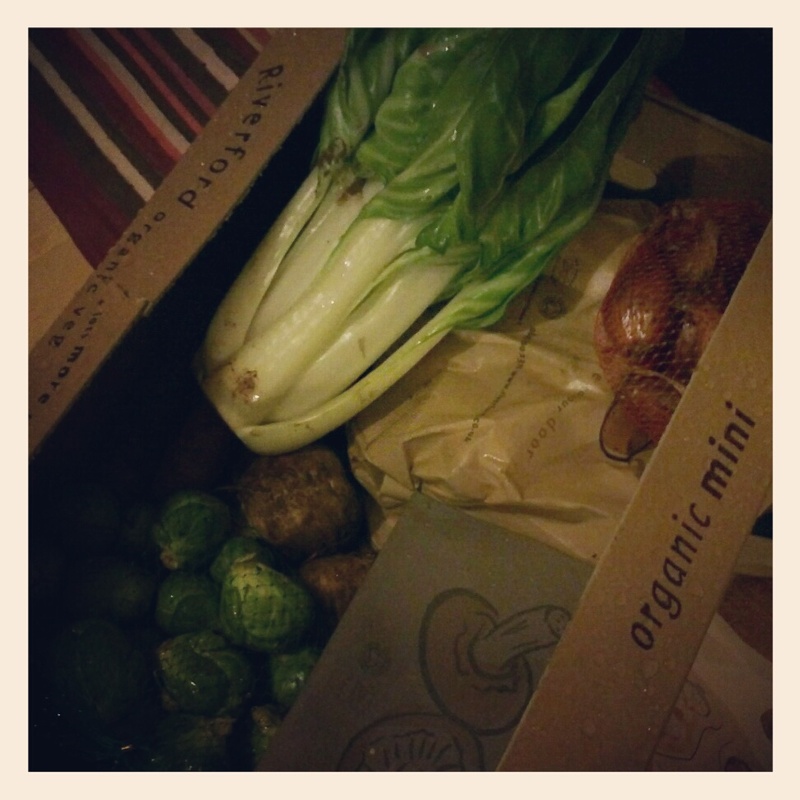 I hadn’t had one delivered for ages, because of being away over Christmas, so it’s nice to have fresh veg in the house again. This week I got the usual potatoes, carrots and onions, plus a yellow pepper, some vine tomatoes, a cucumber (I was meant to have lettuce but they replaced it with the cucumber – Hendrick’s o’clock, anyone?) and just about the biggest swede I have ever seen in my life. I haven’t made anything with my veg yet, but I have a feeling I might have to evoke the spirit of Christmas once more and make one of the dishes that graced our Finnish Christmas table on Christmas Eve. It’s a spiced swede casserole topped with breadcrumbs, and it’s delicious. On Christmas Eve it’s served with the traditional baked ham and potatoes and various other bits and pieces, but I’m sure it’ll make a comforting veggie meal all by itself. 1. Peel the swede and chop into large chunks. Boil in slightly salted water until soft. 2. Strain and mash or blend until smooth. Mix in the cream and breadcrumbs (reserving some for the top), dark syrup, beaten egg and spices to give a soft consistency. 3. Turn into a greased baking dish, press the surface with a fork to make a pattern and sprinkle the surface with a coating of breadcrumbs. Dot the top with butter and bake at 180C for about 60-90 minutes. It’s been such a long time since my last post! The run-up to Christmas was a never-ending stream of pub trips and parties (with a bit of running thrown in for good measure) and then I headed down to Somerset for an extra-long Christmas break with my family. We celebrated Finnish Christmas and English Christmas (with a couple of Aussie bits too), and we did plenty of eating, drinking and being merry. I’m now back at work and attempting to get over the culture shock! What do you mean, I’m not allowed to flump on the sofa with the cat and a handful of Ferrero Rocher for a sneaky afternoon snooze? 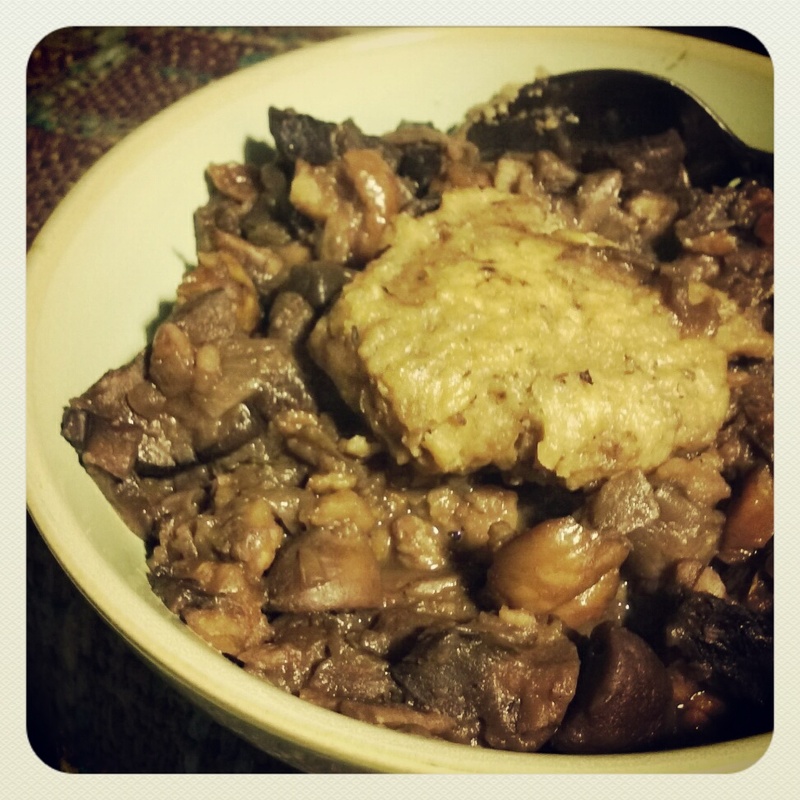 We also did plenty of excellent cooking over the festive break, and I rounded things off with this excellent (if I do say so myself) mushroom and chestnut stew, which was our New Year’s Eve veggie option. My sister and I bought my mum a slow cooker for Christmas, so she made a (by all accounts delicious) beef in beer using that, and my mushroom and chestnut offering was perfect – hearty, rich and gorgeously tasty. We had both stews with Mum’s amazing dumplings, new potatoes, bread (just to complete the carb-fest!) and broccoli. And plenty of fizz to see in the new year! 1. Fry the onions in a large ovenproof saucepan with a little olive oil (I used garlic olive oil) on a gentle heat for 10-15 minutes, until they become translucent and just start to go brown at the edges. 2. Add all of the mushrooms and fry until they start to release their juices. 3. Turn up the heat, add the red wine and simmer for a couple of minutes to bubble away the alcohol. 4. Add the Stock Pot jelly thing, chestnuts and a little bit of water to loosen the mixture (remember that the mushrooms will carry on releasing liquid as they cook) and season with the salt, pepper and herbs. 5. Bring to a simmer and then transfer to a low oven (around 150C) and cook for 1-2 hours until bubbling and thick and gorgeous. Excuse me while I talk about the weather again. It’s stopped raining (after soaking me on last night’s run!) but now apparently it’s going to get COLD. Three degrees as a maximum daytime temperature by Friday. Brrr! There’s a wintry chill in the air already. Parsnips and sprouts just are winter to me, and I decided to use some of them to make a big wintry warm salad. I par-boiled them and then roasted them with some of the mushrooms and a couple of shallots, and a bit of chilli and cumin. 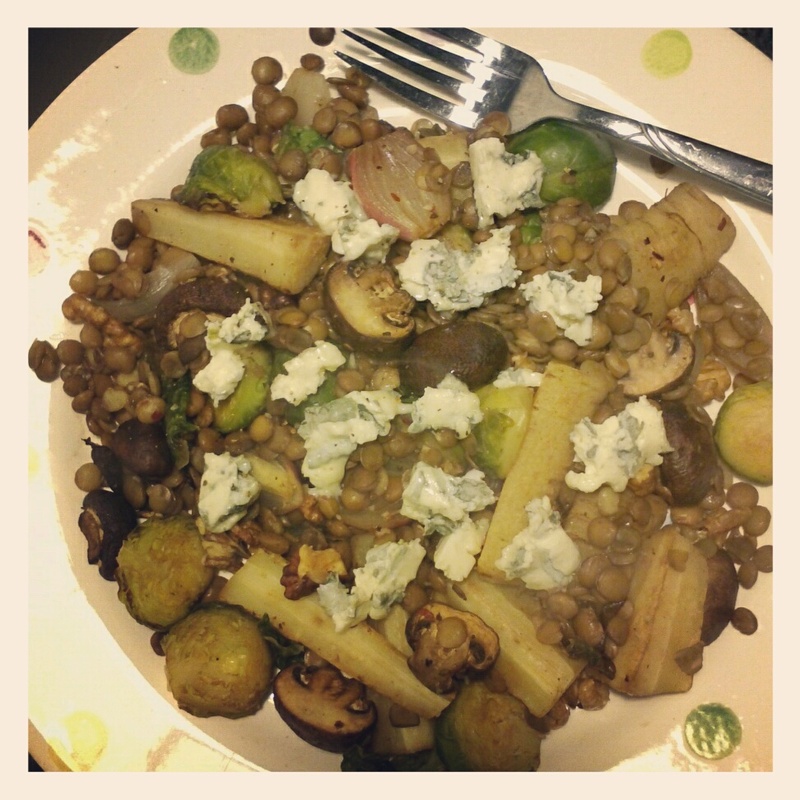 Then I mixed the roasted veg with half a tin of green lentils, a splash of balsamic and plenty of black pepper, tipped it all onto a plate, and put some walnuts and a tiny bit of blue cheese on top (I can’t be trusted with cheese in the house, so if I want some I buy those tiny single-portion snack pieces from M&S). It was SO NICE! Very – dare I say it – festive. 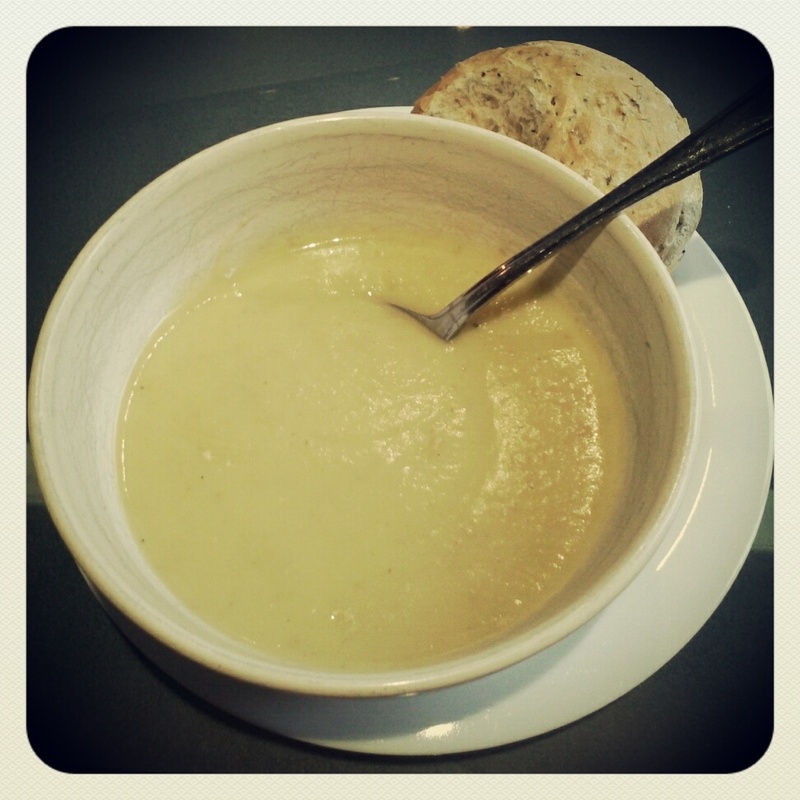 Leek and potato soup for a depressing day! The weather has been AWFUL lately. We’ve escaped any actual flooding here in London, but the rest of the country seems to be largely underwater and there have been all sorts of problems down in the south-west, where my parents live. I based it on the recipe from my good old copy of the Dairy Book of Home Cookery, which coincidentally called for two leeks and 350g of potatoes. It’s actually a recipe for Vichyssoise (with an instruction afterwards saying that you can also serve it hot as leek and potato soup, because obviously Vichyssoise would be one’s first thought…) but it’s as easy as any other soup recipe – I just cooked the leeks with a little bit of oil, added some garlic and nutmeg and black pepper, threw in the diced potatoes with a pint of veg stock, and simmered it for half an hour until the potatoes were really nice and soft. Then I put in half a cup of almond milk and blended it all to a nice smooth soup. I got exactly enough for three 300ml portions, and it was the perfect comfort food for a wet Monday lunchtime! My first post on the new-look blog! Hope everyone has found me without too many problems…does anyone know how to display one’s followers on WordPress? I think I’ve got a lot to learn! Anyway, here’s a post about carrot cake. 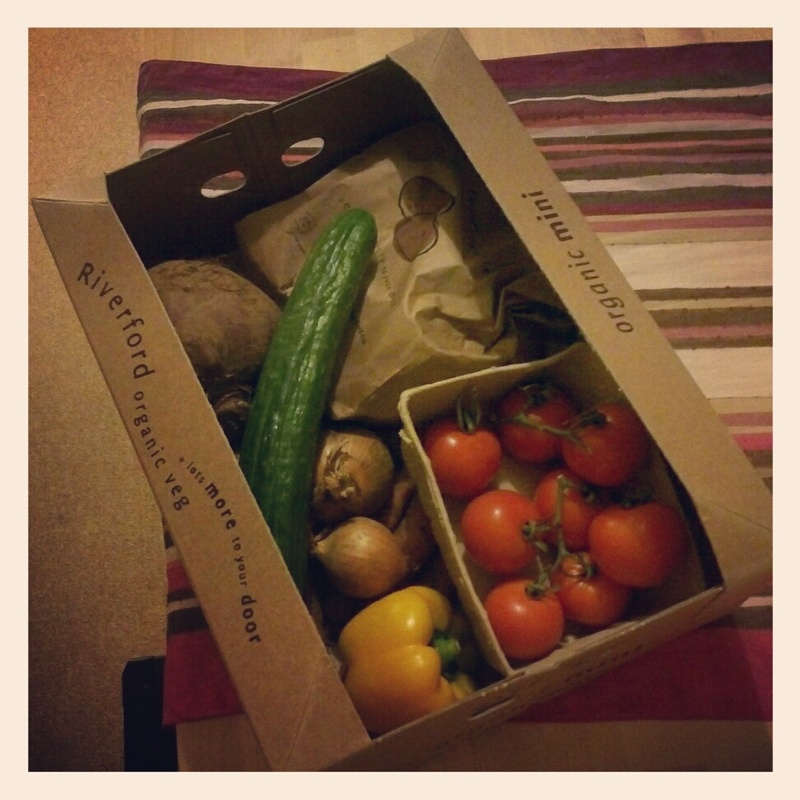 Along with the never-ending Potato Mountain, my veg box often leaves me with rather a lot of carrots. For some reason I can never think of things to do with carrots! But on Saturday I was going to a party and I fancied doing a bit of baking, so I decided to make a carrot cake. I actually used my mum’s zucchini cake recipe (courgette cake to us Brits, but we call it zucchini cake because the recipe’s American) and it worked really well. I wanted to halve it, because the original amounts make two cakes, and as the recipe calls for three eggs I decided to use a mashed ripe banana as well as an egg, and I reduced the amount of oil. Mash the banana in a bowl, add the egg and beat together. Add the oil, sugar, carrot and walnuts and mix well. Add the dry ingredients, mix well, pour into a lined cake tin (I used one that I think is 8″…), sprinkle with sugar and bake at 190C for about 50 minutes. And here’s what it looked like shortly before it was demolished by a horde of hungry runners!